It was super cool to work with Mary-Kate and Ashley Olsen. For a few seasons now, the Olsen twins have been artistic directors for the brand Superga. I don’t know if you’ve seen the sneakers from The Row x Superga collection, but they have some serious sublimity, the felts, the cashmere they use gives them a quota of 100% desirability. I’d met Mary-Kate and Ashley before, during their presentations. I know that they don’t like to have their photo taken too much, but I remember perfectly that for my first presentation, Ashley came over and sat next to me, talking through each and every one of the looks. Me? I was like, trying as hard as I could to take my fashion editor look #12 = super serious and pro and expressionless (where are my black frames?) while the only thing that wanted to come out of me was my hysteric fan look #2 = mouth aghast, crazy eyes and no dignity. Guys. Mary-Kate and Ashley. You kind of start not wanting anyone to get a pic. And anyway, they make that easy. Because the clothes are so good (you know I love the The Row) that very fast, my hysteria went from the twins to the beautiful and poetic clothes. I fell in love with the brand and every season since, I admire more and more the path they are paving. Also, I want to buy every single piece in the collections. So yeah, the day we met for the project for the first time, they for sure had a Starbucks in hand (I mean, it was the morning!) and they were super warm and pro. They explained why they were interested in our work and how they thought the project would shape up. I’m not going to give you an explanation in text because everything is explained in the video, but I just wanted to say that after working with them, I love their world even more!!! je suis fan d’elles depuis toute petite, et je les suis depuis toujours! elles ont réussi leur virage vers le milieu de la mode, elles ont appris à travailler dur pour en arriver jusque là à se faire une vraie place à être prise au sérieux dans leur travail, et je suis contente qu’elles se soient tournés vers ce milieu, ça leur correspond bien! J’aime beaucoup les superga ce sont des baskets très confortables que l’ont peut porter avec tout! En Italie quand je étais très jeune les Superga c’étais la grand mode chez les teen-agers. On les portais avec tout, même avec la robe de soirée et parfois on mettais a la place des lacets des rubans an satin colorée. Ca pourrait être une idée pour les sœurs Olsen ? This was amazing. Haha will you get a tour of The Row? That would be awesome! Félicitations pour cette collaboration avec Ashley & Marie Kate. Inutile de te dire à quel point nous sommes toutes jalouses de toi… ;-). J’ai vraiment aimé le travail que vous avez réalisé pour elles. Je connaissais la marque Superga quand j’étais ado, mais dans ma tête, ça n’avais rien de “chic”, ni de “glamour” comme nous le présentent vos différents portraits. C’est peut-être ça la magie du marketing et de la com, car j’ai tout d’un coup envie de suivre le mouvement, alors que tout en moi a envie de vous demander : “Are you serious?” ;-). Sounds great can’t wait to get home from work and watch the video. Did you have a all black dress code ;) looks cool! J’aime beaucoup les soeurs Olsen, elles sont vraiment “à part”, j’aime leur façon très intelligente de gérer leur image. Je connais à peine Superga (désolée pour mon ignorance) mais j’aime beaucoup ces chaussures qui sont des classiques du casual , élégantes et sport. Tout ce que j’aime! J’aime les différents profils présentés dans le film, est-ce toi qui a fait le casting également? Le Superga! I grew up wearing them all the time, but it has been a long time since I haven’t. Gotta get one pair of Superga, now! Thank you! That’s awesome, congratulations! You guys are just going further and further. I love they’re style, and The Row designs are exquisite. I’m with you, I want to buy everything they make! Oh wow! i thought Supergas would never cross your universe G! I superlove this sneakers, i have countless pairs already…my super fave is one in linen, yellow! :) very happy with this collaboration with mary kate and ashley. I am excited to see their new styles and i hope it will reach the Philippines shores where I currently am. Nope. These girls couldn’t get much cooler (or you & Scott for that matter!!). Tu as tellement de chance Garance! Travailler avec Ashley & Marie-Kate Olsen quoi!! Dommage que la vidéo n’est pas de sous-titrés en français, je n’ai pas tout compris..
Ooh, I had watched your video with the Olsen twins, but didn’t realize ‘The Row’ had actually collaborated on a range for Superga! Am off to check them out now! Wonder how they compare with ‘real’ sneakers (like my Nike Roshe Runs) in terms of comfort…might need to track down a pair for my upcoming trip to Paris! I’ve loved Ashley and Mary-Kate since their Full House days – and this is the best photo I’ve ever seen on them. So relaxed, happy and actually looking at the camera! Can’t wait to feature the Superga shoes on the website. We’ll definitely add in the video too. I think the photos will be great ! I’ve been waiting for this love love love. This is A Fashion Moment! So excited about this, four of the most influenciant people in fashion at the same table! Incredible. Sometimes i wonder if you really know how important is your blog and your opinion on the development of the industry (hysteric fan look #2 at the moment). So many childhood memories!!! I remember when I used to watch their movies when I was little..so so cute! Gah. The Supergas, though. I think I’m smitten. Must buy a pair now. This has got to be the BEST portrait I’ve ever seen of Mary-Kate and Ashley! SUPERB! They must be my age, and basically I grew up with them. What’s striking is that they completely got rid of the ‘cheap’ image associated with kid-stars. They’re now respected in their fashion industry, though they were first actresses. I think that’s a big big achievement. Encore une fois une superbe collaboration. Je connais la marque Superga même si je n’ai pas eu l’occasion d’en porter ado. Ma mère en possède une paire et adore les porter, peut-être vais-je les lui piquer à mon retour en France, qui sait..la magie du marketing & de la com ahahaha. Mis à part mes troubles existentiels de blogueuse et de jeune diplômée, ça fait du bien de voir les soeurs Olsen parler et de savoir ce qu’elles font, ce qu’elles pensent, bref leur travail quoi. De voir toujours les gens sur papier glacé et étiquettés “Fashion Icon” des fois ça devient agaçant, c’est pour ça que je ne vous remercierais jamais assez de cette vidéo et de ce projet :). Now I am officially jealous! How great for you Garance! These girls are seriously the coolest and most hard working! C’est génial de vous voir travailler ensemble (avec Scott), et avec les soeurs Olsen c’est encore mieux! J’adore! I like under the distinct impression that there is nothing cooler than an Olsen. They are just so effortlessly awesome. Sympa cette collab’! Et j’adore les superga, c’est mes tennis fétiche. super cute! I have hard time wearing flat shoes :( … But it’s betting increasingly hard with my lifestyle not to have few pairs that I can walk miles in the city in… these are super cute and the Olson twins are adorable! C’est génial comme collaboration, bravo! Et puis là, elles m’en bouchent un coin avec ce look sublime noir casual avec des baskets, elles sont très belles. Tu écris d’abord tes post en français, ou en anglais ? Garance that is so awesome!! And the photo is so cool! Ce post me rend complétement jalouse! J’adore ce que font les soeurs Olsen. J’adorais leurs films/séries quand j’étais petite, et leurs projets (mode, films d’auteur) ont évolués en même temps que mes gouts, et je suis faaaaaaaaaaaaaaan comme une gamine de 8 ans et demi. That’s true. A good team and everything well done. Make me want to get a pair!!!! I used to wear Supergas (the white ones of course) in the mid 90’s. By the way, it is the first time i see those twins well dressed. Sur cette photo, elles semblent tellement sain, à l’aise, ds leur élément!! Très jolie photo!! wooah!!! je les adore, j’était en admiration devant elles dans La fête à la maison quand j’était petite, j’adorais tellement Michelle ;) Et puis maintenant je suis tout à fait d’accord avec toi pour leur look, et leurs marques j’aime aussi mais ça reste un peu cher pour moi…par contre je ne connaissais pas ces baskets. “vu que la seule expression que j’aurais pu avoir à ce moment là aurait été fan hystérique #2 = bouche ouverte & yeux exorbités & no dignité. Putain, Mary Kate et Ashley, quoi” non mais j’adore, je rigole devant mon écran sous la couette !! 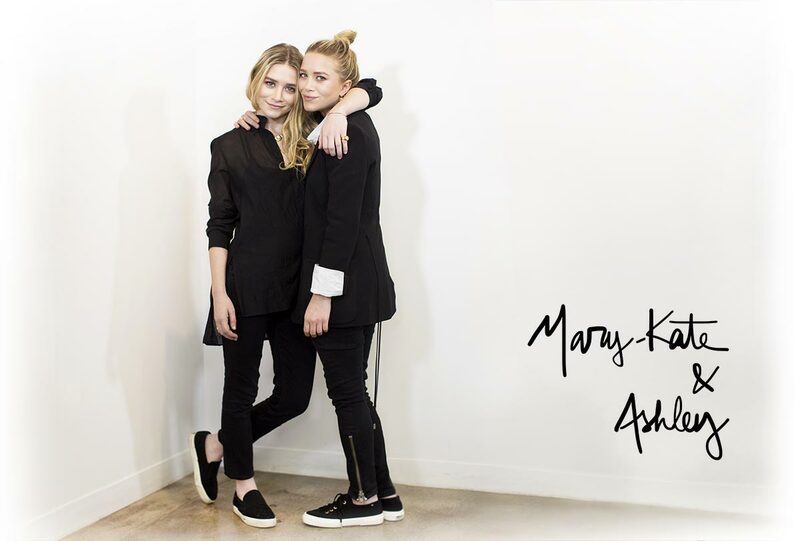 It would be great to watch a video with Garance interviewing Mary Kate and Ashley! I remember when I was 12 I used to watch “Two of a kind” and I loved their style so much I wrote a bunch of letters to them (in my very basic English back then) telling them how much I loved her clothes (which I knew they had a lot of influence over). Now I feel kinda ridiculous saying this but well, I was a fan! Oooooh Garance, I’m so happy for you! You were major before (hello Kate Spade)–but this is MAJOR. When the Olsen twins want your help… damn, that’s fantastic. You are the blogger who inspires us all. I’ve been reading since the days before you had an English translator and damn, but it was worth puzzling through with my bad French even then. Sending you so many warm fuzzy feelings, as warm and fuzzy as cashmere from The Row. Years and years from now, when the world of fashion has changed again entirely to another unforeseeable new thing, people will look back on this blog as the one that began it all. You’ll be like Avedon, really you will, and we will feel so lucky to have watched you as come into it. Tres cool. Buying some superga’s NOW! Free shipping…youpii. oh god,this is so exciting!! they are amazing. so much poise and grace. and i couldn’t agree more with you about the perfection of their red carpet looks. love the video and can’t wait to see how the collaboration turns out. I, too, love their style! They get a lot of criticism for their “ugly” red carpet looks, but I agree with you that they look classy. I love that they don’t flaunt their half-naked bodies around like so many celebrities these days. And they are professional and work hard for their businesses. I admire them a lot. Thank you for sharing the video! Elles sont trop cool ces filles. Mary-Kate sort avec le frère de Nicolas Sarkozy, c’est un couple improbable. Ca la rend encore plus cool je trouve. Super photo, ça donne envie de faire un câlin à mes 3 soeurs ! D’ailleurs c’est leur anniversaire aujourd’hui! 27 ans! J’ai fait un article sur elles dans mon blog, je les adore! Can you believe that they are fraternal twins and not identical twins, but I cannot tell them apart (but with the height). They’re so talented. Mais j’ai un message à faire passer à Superga: c’est que j’en portais depuis toujours. Chaque été j’en achetais une nouvelle paire car j’aimais qu’elles soient bien blanches. Elles étaient Made in Italy. Et puis un beau jour ils ont délocalisé la production:Made in Vietnam. Et celles là n’étaient plus comme avant: elles se sont vite abîmées, l’arrière ne tenait pas bien, alors je suis passée à Converse. Voilà l’histoire. Garance, You look sooooo good! I know that s not a personal style kind of blog, but You should post photos of Yourself bit more often! by reading Your posts we feel like Your best friends and still we get to see You so rarely. More Garance please! Heeeeeey! Congrats to you, Scott and your team for the fantastic project! But your picture made me think about my twin sister : we both plan to to create our own brand and hope one day we’ll have a picture of us on garandore.fr! Whaaa Trop la CLASSE!!! Bravo à toute l’équipe!! Does anybody know which sneakers Mary Kate is wearing on the photo? The black canvas slip ons? How amazing! Would love a project like this, so simple when you believe in your product! Love it! Argh! I’m in luuuurve! I need me a pair stat! Excellent choix de la part de Superga que les sœurs Olsen et vous. J’avais vu qui.une des sœurs Olsen portaient des slippers noirs que je pensais être des Vans et que j’avais cherché sans succès.. Je présume donc que si elle les porte sur la photo ce sont des protos de la prochaine collection. Je suis donc pleine d’espoir. Aussi jolies que les Superga, mais en cuir, je vous conseille d aller voir les ETQ Amsterdam…. ( ETQ pour Étiquette)… Des sneakers made in Hollande….mon coup de cœur Web de ces dernières semaines…la finition est top ! What a stylized video! I admire Mary-Kate and Ashley for standing by their work and really making great style that represents their name well. I am itching for a pair of Supergas. what watch are you wearing in this video? i’ve been looking for a fabolous classic gold watch and the watch you’re wearing seems to be the epitome what i’m looking for. Garance! At the risk of being nosy which is completely inappropriate, I know…Do you have something on your ring finger? The girls are just awesome!!! Trop la classe Garance =) félicitations a toute l équipe !!! Moi j’ai trouvé le sac à dos de Devon Ashely Head VRAIMENT très joli (à 0:41)! Est-ce que quelqu’un connait cette marque? Bonjour Garance, on ne peut plus voir la vidéo, serait-il possible de la retrouver autre part ? Hi Vicky! Thank you for the comment! We are working on fixing this link for you! toujours aucun moyen de visionner la video ? Hi, could you guys make the video available again? I’d love to watch it!